One signifi cant religion that had long-lasting effect all over the world and, like Mithraism, became a serious rival to Christianity was Manichaeism. It was a belief that was close to Christianity, Judaism, Mithraism and even closer still to Zoroastrian Dualism but it became such a great rival and danger to Christianity that it was declared by Christians to be the creed of infi dels, a heresy, and they waged a serious war against it. It was based on the belief in human salvation through one savior (as Christ in Christianity). It was a church that advocated a dualistic doctrine that viewed the world as a fusion of spirit and matter. The "elects" who were the most serious believers and followers: people of goodness and self sacrifi ce who did not marry, not eat meat or poultry (but they did eat fi sh) nor did they drink wine. The "hearers" or ordinary people who married, ate and drank normally but avoided lies and the accumulation of wealth. The past religions held strong as long as the leader was alive and thereafter disputes and differences erupted but mine is bound to last forever being based on wisdom and common sense. Anyone who joins my followers is bound to fi nd salvation. Clearly, he intended to promote a truth that was capable of being equally translated into diverse formulas according to the different circumstances where it was to spread. Mani's Birth Many scholars suggest Mani's date of birth to be 14th April 216 AD and his birthplace is said to be the village of Mardina east of Babel, then a part of the Persian Empire and now in Iraq. This was a region largely infl uenced by Jewish and Christian teachings. His father was named Pattig, a Parthian prince from the city of Hamadan and his mother was Maryam also of Parthian descent. Mani's teachings were first encountered by the resistance of the Magi in Zoroastrian Iran and the Orthodox Christian priests in Greece, particularly since Mani wished to propagate his teachings across the world. His many journeys to countries far away and those of his messengers were very effective in converting millions to his creed. He is said to have been less than 12 years old when a spirit appeared to him, calling himself the "Taw" meaning the "Twin". Twelve years later the Twin reappeared to Mani and then he decided to travel East towards India. Mani, like prophets before him, discussed the matter with his parents and close relatives and then traveled eastwards to India and Turkistan. But in the year Shapur, Ardeshir's son, was throned, he decided to return to Persia. Under Shapur he was permitted to preach his religion freely. At a time when paganism was giving way to Christianity, Mani's teachings seemed to be a serious threat to Christianity, in its rivalry with this religion in overcoming paganism. But, quite the contrary to what Mani had predicted, his religion did not last long, neither in the East nor in his own homeland, where Bahram eventually imprisoned and tried him. When he died in prison after a trial that lasted 26 harsh days, his followers were persecuted and tortured. Even so they endured, for 1000 years, all forms of persecution. It is a wonder how his teachings lasted that long under such conditions. Mani wrote seven books of which six were written in local East Aramaic, his own language, and one in Parsic. A review of the last reveals that Mani did not have mastery in this language. According to Manichaeism the primitive human being had fi ve brilliant "elements" with him when he was born, which he wore as his armors. These fi ve elements were gods: the god of wind, god of earth, god of water, god of fi re and god of Farvahar. With these armors he went to war against darkness but in the battle he became unconscious and the King of Darkness took away his fi ve armors. But because he was not polluted with sins and evil he managed to continue his battle against Darkness. 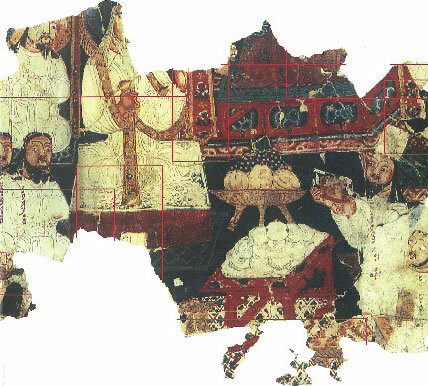 In the early years of the 20th century archeologists discovered, in the Sing Kiang Province of China, manuscripts which included many fi ne paintings all written by the followers of Mani which revealed a great deal about the creed and its followers. It showed that these people loved fi ne paintings, beautiful calligraphy, and good music. Indeed Mani and his followers were so fond of painting that he is often called the painter Prophet. As pointed out earlier Mani's religion was a mixture of many beliefs but most notably it was under the infl uence of Zoroastrianism with its notion of the ongoing battle between Good and Evil, Light and Darkness, with Evil prevailing for the moment but bound to lose the battle to Goodness which shall one day overcome Evil and rule the world forever. For a time Manichaeism spread rapidly across the world such that even St Augustine, one of the leading personalities in Christianity, accepted it for some time. It was fi rmly rooted in parts of France for many long years and in the East it was adopted by the Chinese during the Tang Era and was the offi cial religion of Turkistan for over 80 years. But in the end it faded away and lost all its followers.